Eastern junior Sharp Facmyer (18) slips past a Federal Hocking defender during the Eagles’ win on Sept. 15 in Tuppers Plains, Ohio. River Valley junior Layne Fitch carries the ball during the Raiders’ Week 1 win over Eastern on Aug. 25 in Tuppers Plains, Ohio. Last Week: Meigs lost to Point Pleasant 56-16, in Point Pleasant; Wellston lost to Athens 14-13, in Wellston. Last meeting between the teams: Oct. 21, 2016. Wellston won 43-12 in Rocksprings. Current head-to-head streak: Wellston has won 1 straight. MHS offense last week: 138 rushing yards, 152 passing yards. WHS offense last week: 222 rushing yards, 26 passing yards. MHS offensive leaders last week: QB Zach Helton 6-20-2 126 yards, 1TD; RB Zach Bartrum 13 carries, 64 yards; WR Cole Adams 3 receptions, 78 yards, 1TD. WHS offensive leaders last week: QB Michael Graham 2-7-0 26 yards; RB Travis Jayjohn 30 carries, 149 yards, 2 TDs; WR Rylan Molihan 2 receptions, 26 yards. MHS defense last week: 396 rushing yards, 162 passing yards. WHS defense last week: 184 rushing yards, 149 passing yards. 1. Prior to last year’s WHS victory, the Marauders had won three straight over Wellston. Meigs holds a 25-19-1 record over Wellston in all-time meetings. 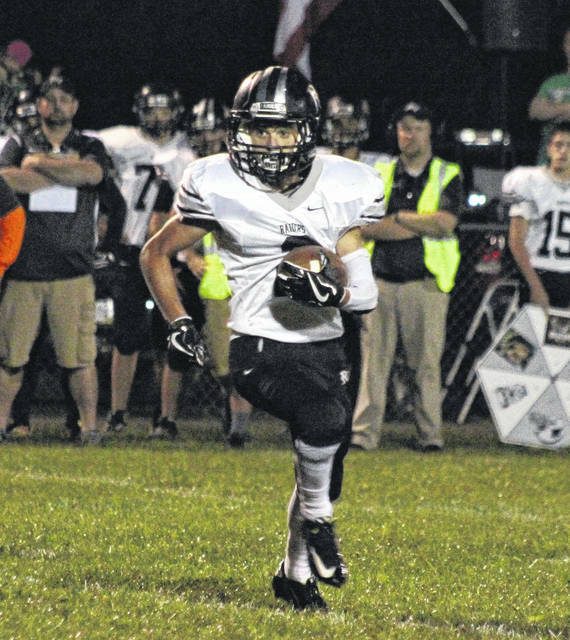 The Marauders last visited Wellston on Oct. 23, 2015 and the guests came away with a 50-38 win. 2. This is the final of Wellston’s five home games. The Golden Rockets are 2-2 at home this year, and a win will give WHS its first winning record at home since 2006. Meigs is 1-3 on the road this year and is traveling for the final time this season. 3. The Marauder offense has earned 109 first downs and 2,343 yards this fall, with 1,326 of their yards coming through the air. MHS has passed for 15 touchdowns, rushed for seven and scored twice on special teams. 4. Both teams have faced Athens, Nelsonville-York and River Valley this season. Meigs topped RVHS by a 45-28 margin, while the Golden Rockets earned a 28-7 win over the Raiders. NYHS claimed a 49-14 win over Meigs and a 34-2 win over Wellston, while Athens topped each team by just one point. 5. Wellston is Meigs’ first opponent since Week 5 to enter without a winning record. The Marauders last three foes were a combined 15-1 before facing the Maroon and Gold. Last Week: Belpre lost to Valley 48-7, in Belpre; Eastern lost to Trimble 31-0, in Glouster. Last meeting between the teams: Oct. 21, 2016. Belpre won 25-20 in Belpre. BHS offense last week: 10 rushing yards, 127 passing yards. EHS offense last week: 24 rushing yards, 99 passing yards. BHS offensive leaders last week: QB Brandon Simoniette 5-13-0 127 yards; RB Brandon Simoniette 6 carries, 14 yards; WR Logan Adams 3 receptions, 80. EHS offensive leaders last week: QB Conner Ridenour 6-13-1 89 yards; RB Josh Brewer 13 carries, 26 yards; WR Sharp Facemyer 4 receptions 62 yards. BHS defense last week: 359 rushing yards, 94 passing yards. EHS defense last week: 161 rushing yards, 176 passing yards. 1. Since BHS joined the TVC Hocking, the Golden Eagles hold a 4-3 record over EHS, Belpre’s last trip to EHS resulted in a 46-6 BHS victory on Oct. 23, 2015. 2. This is the final home game Eastern, which is 1-3 at East Shade River Stadium this fall. Belpre won’t travel again after this game. BHS enters with a 1-3 record away from home. 3. This season, Eastern has rushed for 1,063 yards and thrown for 699 yards. The Eagles have earned 95 first downs, 12 rushing touchdowns and eight passing touchdowns. 4. These teams have faced five common opponents in Federal Hocking, South Gallia, Trimble, Miller and Wahama. Both EHS and BHS defeated the Lancers and Rebels, while losing to the Tomcats and Miller Falcons. Belpre defeated the White Falcons by 22 points, but the Red and White topped Eastern by 21. 5. Eastern’s offense has struggled during its three-game skid, with neither the rushing or passing attacks surpassing the century mark in any of three contests. EHS has allowed an average of 291.7 yards in the last three weeks. Last Week: Southern lost to Waterford 14-6, in Racine; South Gallia lost to Wahama 41-6, in Mercerville. Last meeting between the teams: Oct. 21, 2015. Southern won 52-14 in Racine. SHS offense last week: 197 rushing yards, 47 passing yards. SGHS offense last week: 177 rushing yards, 4 passing yards. SHS offensive leaders last week: QB Logan Drummer 3-12-1 47 yards; RB Riley Roush 30 carries, 127 yards, 1TD; WR Gage Shuler 2 receptions, 30 yards. SGHS offensive leaders last week: QB Jaxin Mabe 1-3-1 4 yards; RB Kyle Northup 40 carries, 174 yards, 1TD; WR Austin Stapleton 1 reception, 4 yards. SHS defense last week: 149 rushing yards, 81 passing yards. SGHS defense last week: 398 rushing yards, 29 passing yards. 1. The Tornadoes are 11-9 against SGHS in all-time meetings, including 4-3 in TVC Hocking play. Southern’s last trip to Mercerville was on Oct. 23, 2015 and resulted in a 48-21 SGHS victory. 2. This is South Gallia’s final chance to play in front of its home fans this fall, as well as the final road game for SHS in the regular season. SGHS is 2-3 in Mercerville this season, while Southern enters with a 2-2 road mark. 3. The Tornadoes are averaging 20.6 points per game in the first half this season, but just six points per game after that. SGHS is scoring 7.9 points per game in the first half and 9.6 points per game in the second half. 4. Both teams have faced Waterford, Trimble, Federal Hocking, Belpre and Wahama this season. The Wildcats and Tomcats defeated both SGHS and SHS, while Federal Hocking fell to the Rebels and the Tornadoes. 5. The Tornadoes are currently rated 12th in the Region 27 playoff ratings, while South Gallia is 21st. A total of 11 teams in the region enter Week 9 with a winning record, four are at 4-4, while 12 are below .500. Last Week: Ironton lost to Coal Grove 28-7, in Coal Grove; Gallia Academy lost to Rock Hill 56-54, in Pedro. Last meeting between the teams: Oct. 21, 2016. Ironton won 49-0 in Gallipolis. Current head-to-head streak: Ironton has won 7 straight. IHS offense last week: 44 rushing yards, 126 passing yards. GAHS offense last week: 148 rushing yards, 472 passing yards. IHS offensive leaders last week: QB Gage Salyers 14-19-2 126 yards, 1TD; RB Gage Salyers 11 carries, 17 yards; WR Garrett Carrico 8 receptions, 71 yards. GAHS offensive leaders last week: QB Justin McClelland 24-38-1 472 yards, 5TDs; RB Justin McClelland 13 carries, 88 yards, 2TDs; WR Caleb Henry 7 receptions, 126 yards, 1TD. IHS defense last week: 335 rushing yards, 32 passing yards. GAHS defense last week: 444 rushing yards, 36 passing yards. 1. These schools first met on the gridiron in 1923 and Ironton holds the edge in the series by a 45-12 clip. The Blue Devils last defeated the Fighting Tigers on October 6, 2006 in Ironton, by a count of 14-7. Prior to that, GAHS hadn’t defeated IHS since 1984. 2. The Blue Devils will take the field in Gallipolis for the final time this fall, having won two of their previous four home games. GAHS hasn’t finished with a winning home record since 2012. Ironton is 2-2 on the road this season, traveling for the final time. 3. Through eight games, GAHS has 2,655 yards of total offense, including 1,616 on the ground. The 620 yards gained last week is a season-high. It was the third time the Blue Devils have surpassed the 400-yard mark and the fourth time they’ve passed 300. 4. Both teams have faced Fairland, Coal Grove, Chesapeake and Rock Hill this season. The Dragons and Hornets defeated both Ironton and Gallia Academy, while the Blue Devils and Fighting Tigers both topped Chesapeake. RHHS lost to Ironton by 27 points, while defeating GAHS by two. 5. During the Blue Devils’ three game skid, they’ve allowed 395.3 yards per game and 46 points per game. GAHS has earned 338 yards per game and 35.3 points per game in that span. Ironton had a three-game winning streak interrupted last week. 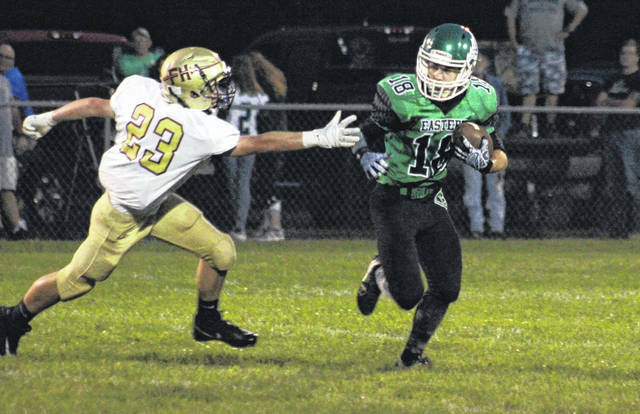 Last Week: Athens defeated Wellston 14-13, in Wellston; River Valley lost to Vinton County 41-13, in McArthur. Last meeting between the teams: Oct. 21, 2016. Athens 25-15 in The Plains. Current head-to-head streak: Athens has won 1 straight. AHS offense last week: 184 rushing yards, 149 passing yards. RVHS offense last week: 79 rushing yards, 134 passing yards. AHS offensive leaders last week: QB Clay Davis 9-21-0 116 yards, 1TD; RB Evan Adams 21 carries, 115 yards, 1TD; WR Treyce Albin 6 receptions, 77 yards. RVHS offensive leaders last week: QB Patrick Brown 12-27-3 134 yards; RB Patrick Brown 12 carries, 47 yards, 1TD; WR Dustin Barber 5 receptions, 75 yards. AHS defense last week: 22 rushing yards, 26 passing yards. RVHS defense last week: 296 rushing yards, 190 passing yards. 1. The last time Athens visits Bidwell was Oct. 23, 2015, with the Raiders earning a 35-21 win. That game is River Valley’s only win over AHS since joining the TVC Ohio. 2. This is the Raiders’ home finale, with the Silver and Black entering with a 2-2 record in Bidwell this season. River Valley has finished with a winning record at home for three straight years. 3. The Raiders have gained 2,198 yards of total offense this year, including 1,179 through the air. RVHS has thrown for 10 touchdowns, rushed for nine, and scored once on defense. 4. So far this season, both teams have faced Meigs, Vinton County, Wellston and Alexander. Athens defeated all four, by an average of 16 points. RVHS topped the Spartans by 12 points, but fell to the other three by an average of 22 points per game. 5. River Valley has been successful on 16 of their 20 point-after tries this season. The Raiders are kicking extra-points at a 14-of-17 rate. RVHS was successful on its only two-point run, while going 1-for-2 on two-point pass attempts.